I like finishing my knitting projects late at night. As much (or as little!) as I've measured, swatched, blocked and seamed, I never really know how it's going to look until I slip it on. I prefer to do that first try-on by myself -- if it's going to look bad, I'd rather learn that on my own. If it's fabulous, I can indulge in a Minor Conceit Session in private. Smooch was no exception. I finished the knitting and seaming (marvelling at the Hannukah yarn all the while!) long after Jason had gone to bed. I slipped it on, held my breath, and walked over to the mirror. Let the Mild Conceit Session commence! Some knitters expressed discomfort with Smooch's plunging neckline, but I'm of the opinion that if it looks good and you don't wear it inappropriately -- then there is no such thing as neckline too low! In other words, this Smooch by itself is a night-time tank. During the day, I'd probably layer a bit -- which is what I did when I wore it Knitsmiths a few days later, and Alison snapped this picture of the tank in all its layered glory. I do wish that I'd made it just a wee bit longer, but I'm nit-picking -- I really love it. Speaking of the V-neck, Sarah asked in the comments if I could elaborate on the extra-stitch technique I was using to avoid streched-out stitches at the neck divide. I'll give it a shot! another alternitve for your loose stitch issue whenever you have to divide and place stitches on a holder. 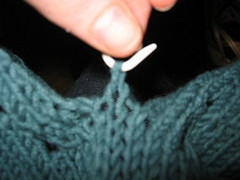 this is something that i read somewhere that works great for me and it keeps those center stitches at a divide tight. find the point where you're going to seperate the stitches and put a marker there if it helps. just cross your stitches, just take the stitch on the right side of the marker and swap it with the one on the left. might be something you might want to try and it would prevent you from needing to tac down an extra stitch on the wrong side. Posted by shannon at June 24, 2005 2:22 PM | For related posts: For Mom, Smooches! Smooch is beautiful. Thanks for the tips on handling v-necks. 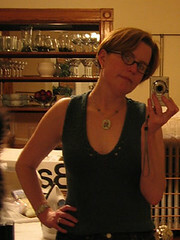 I love v-necks and am happy to have a way to prevent the loose stitches. Smooch turned out great! Very fitting and flattering on you. Smoocharific! I'm wearing mine today, perfect timing for your post. I agree, let the neckline plunge (ahem, all day at work, I take the plunge day or night!). I hope you took your well deserved MCS for Smooch -- it looks fabulous both layered and on its own. I'd comment on your latest post except I could seem to manage it. Anyway, congratulations! Enjoy your honeymoon! My honeymoon this spring was to Bali and I went crazy shopping for batik and ikat fabric. My only advice, based on personal experience there, is: Don't give your new husband heat stroke dragging him around to textile shops in the middle of a sunny day. Luckily mine recovered and is still understanding of my obsessions. That Smooch is adorable and you look fabulous in it! I guess the right yarn did the trick for you! I'm so happy it finally all worked out. Ooh, looks great, and great on you! Congrats! That's a great tank! I love the technique. That is something I've been wondering about for awhile. That goodness someone else figured it out!